Featuring charming cottages set on U.S.-2 10 miles from the entrance to Glacier National Park the non-smoking Stanton Creek Lodge also gives our guests access to a full-service bar and cafe on-site. This property has six cottages and eight RV spots. The cottages feature TVs coffeemakers mini-fridges and microwaves. Select units have in-room bathrooms while some have access to private bathrooms in an adjoining bathhouse. The lodge also has a limited front desk full-service bar and cafe. Parking is complimentary and pets are welcome. 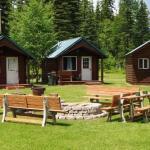 Stanton Creek Lodge is located off U.S.-2 at Mile Marker 170 along the Middle Fork of the Flathead River. The Essex Amtrak station and entrance to Glacier National Park next to Izaak Walton Inn is 10 miles away and West Glacier and the Amtrak is 15 miles. Glacier Park International Airport is 40 miles from the hotel.